Selecting kitchen counters can be an exhausting process. What material shall I use? What color/pattern shall I select? What finish shall I use? Consumer Reports actually ranks the different kitcen counter materials. For me, I wanted an attractive, low maintenance solution. So, the toss-up was between engineered stone and natural granite. I really liked many of the colors offered by CaesarStone, a manufacturer of engineered stone. However, most showrooms only display a small sample block of the engineered stone, usually in a binder. I found it difficult to visualize how an entire slab would appear based on a small square slab. In contrast, granite is easier to visualize since you can pick the actual slab that will be used to fabricate the counters. However, granite offers a lot of different colors and patterns, and each slab offers some variance from the others. I ended up picking granite over Caesarstone mainly out of price considerations. A designer suggested black honed granite, which is more of a grayish black instead of a true black. 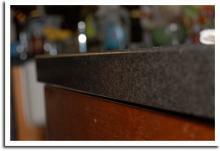 Honed granite has a matte finish instead of a polished, glossy look. Granite Gold works great at cleaning polished granite. For a honed surface, I find that hot water and a microfiber works well at removing the shine when some cooking oil splashes on the counter.